I Vectored This Image, From The Toshiro Fighting Halibel...! Cool one ^^! I like the intense blue you used. He is really my fav in Bleach! Thanks! I agree with AllBlacks, I really like the intensity of the blue here, his eyes really stand out. I think it looks really amazing! You should really do more vectoring like this for Bleach, because this look very good! You should REALLY consider using some of the more recent manga scans because I'm positive if you did this same thing with Ichigo's new looks, as well as Aizen it would look AMAZING! Quote by MisaSasekageI agree with AllBlacks, I really like the intensity of the blue here, his eyes really stand out. I think it looks really amazing! You should really do more vectoring like this for Bleach, because this look very good! You should REALLY consider using some of the more recent manga scans because I'm positive if you did this same thing with Ichigo's new looks, as well as Aizen it would look AMAZING! Added to favs! I look forward to more great work from you! 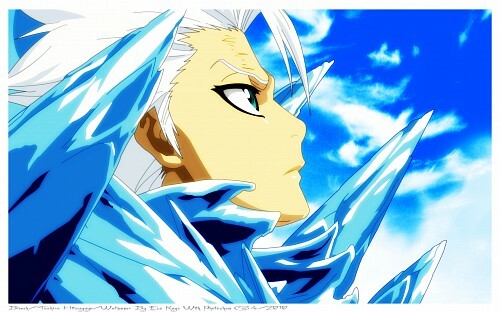 Thanks for this awesome scan Hitsugaya! Wow...Captain Hitsugaya in Bankai Mode. That is so awesome! The colours look great. love it. great wallpaper! thanks for sharing!